Captain Kidd was born around 1645 and was inelegantly executed in Wapping by hanging in 1701. Depending on your point of view he was one of the best and most notorious pirates around in the era or he was the victim of farce and mistaken identify worthy of a Carry On film, albeit one with a slightly grim end. This Sam Smiths pub bears his name though sadly other than the fact that the ill fated Captain (who was such a fat git the rope broke on the first attempt) was hanged nearby it lacks any real historical interest. It is however still a fairly good pub. Standard of what you might expect of a brewery that does tend to be reliable when it comes to creating a decent and welcoming interiors. The downstairs bar is roomy and has a great expanse of windows at the far side which give a great view of the river. There is additionally a bit of seating outside for those few days in the year when we’re bathed with cancerous ultraviolent radiation rather than being drenched with a mild solution of corrosive chemicals. In terms of booze it’s pretty good, a comforting array of Sam Smiths favourites as well as the typical lager beer. 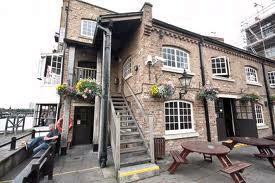 It is also universally known that a Sam Smiths pub is a well priced pint pub. I optimistically ordered three pints and two bags of crisps and handed the barman a tenner only to be pleasantly surprised with some change rather than a demand to shell out more of my hard earned wedge. These pubs also seem to present a paradox whereby you can order two identical beers and still be charged £5.47 or some similar and evidently non divisible amount. Also on offer was a fair selection of flavoured stouts including a chocolate beer, personally I think this sounds like one of the rejects from Willy Wonkers lesser known distillery factories but it might be to someone’s liking? Certainly not mine though, horrific. All in all I’d say this place is worth a trip. It’s only a stones throw from the Wapping Overground station is friendly, cosy, cheap, pubby and has a noose above the front door – what’s not to like?